You see, driving has always been something my husband and I love to do together. We had to get creative about how to keep them happy in the car so that we can enjoy the trip too. 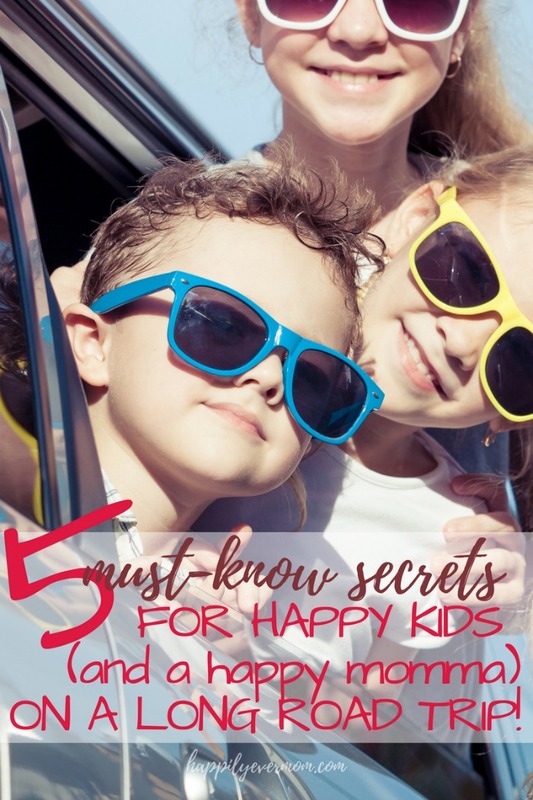 Does that mean that our road trips are always free from tantrums and tears? Do we *always* get to finish a conversation in the car? But, these tips WILL make your life easier on the road. Which means that you may get a few moments to sip your Starbucks in peace and actually have a conversation with your hubs without being interuptted ten thousand times. After ten years of marriage, three kids, and more airplane travel and road trips than we can count, these are our best secrets for not only surviving a road trip with kids while enjoying it too. We try to leave on a road trip so that our midway point will be a stop for lunch. If it’s a particularly long road trip, we like Chuck E. Cheese’s or another fun place so that the kids have some place to stretch their legs and have fun. You can grab a pizza and let the kids get a ton of energy out by playing games and even riding on toys. If you haven’t been to Chuck E. Cheese, you can earn tickets as you play games. Then, you redeem the tickets to earn a prize. We use those to entertain our kids for a while in the car once we’re back on the road. It’s a win/win! Be sure to look for a Chuck E. Cheese’s or your lunch stop ahead of time so you’ll know exactly when and where to stop. Chuck E. Cheese’s has teamed up with Kids Play Safe – which is a program that implements healthy and safe cleaning practices store wide. Not only that, but Chuck E. Cheese’s received Kids Play Safe certification. This certification is for organizations that make green changes to impact health and the people who come to Chuck E. Cheese’s. You get free entry, a stamp on your hand to make sure that kids are check in and out properly, AND there’s wifi. So, the kids can play while you get a little work done at the stop. Yummy food – my kids absolutely love the pizza and salad bar options. It really does make for a great stop on a long road trip! We try to stop midway on the way home too, but we tend to leave later in the day after we’ve had lunch. So, our midway stop generally includes stopping at a store. We let the kids pick out a new movie to watch for the rest of the trip. It keeps our sleep kids happy and gives my husband and I a chance to chat! Do you still have a napper? I do – two of them. As we were gearing up for our lonnnng road trip to Yosemite with a 6 year old, 3 year old, and 3 month old, we knew that we were going to have an issue with our middle son needing to take a nap. He will not sleep if the ipad is anywhere nearby. And, if a movie is on? Forget about it. He’ll keep himself awake. So, I told my husband that we should try listening to an audio book when he gets sleepy. I wasn’t sure if it would work, but every time we needed my sons to sleep (both the baby and the preschooler), we turned on the book. It was like magic. Seriously. Both boys would fall asleep within minutes. It’s worth trying this little trick if you’ve still got a napper on the road! I love remembering all the special things that my parents did when we went road tripping as a kid. One of those was getting to have McDonald’s for breakfast. We NEVER went to fast food, unless we were headed on a road trip, so it was a BIG deal. For my husband? His family always ate “vacation crackers” (aka those orange cracker packs with peanut butter in the middle – you know the ones?). Anyway, they loved to eat on the road. Did you have a snack tradition too or is it just us?? For our kids, we normally buy a pack of lollipops (which they can earn as they complete this bingo card), we buy their favorite granola bars, and tons of bananas. Turns out, my kids love bananas on road trips and their easy to have on hand for the baby as well. The fun part is that if you do this every time, your kids will anticipate getting certain snacks during the trip and it makes things even more special. Tip: This is a great way to keep special treats “special.” For example, if your little one always asks for a lollipop at the grocery store, remind them that they only get those special treats on road trips! Depending on how far we’re traveling, I normally fill a collapsible tote box (Here’s a close match on Amazon), with my son’s favorite toys and tons of workbooks/coloring activities for all of my kids. I keep it up front with me, so that I can hand things out as the kids need them. You can see all of our favorite road trip activities for kids HERE. My daughter loves to draw, so it’s easy to entertain her with workbooks. However, my son prefers toys over workbooks. So, we normally take these take a part cars. They are AWESOME. Check them out HERE. If you have everything in the tote, it’s easy to hand things back to the kids as they get antsy, but don’t give them all out at once! Instead, hand them back every hour or so or when kids are getting really restless. For little ones, they have NO concept of time, so it won’t make sense to them if you say we’ll be there in about 2 hours. Instead? We try to “measure time” by comparing the time to how long it takes for them to watch their favorite shows. Or, “It takes about 1 paw patrol for us to get to the next spot.” I’m not kidding. But, it works! We also use prior road trips to help our kids understand how long it will take us to drive somewhere. This really helps my oldest child, who’s seven, but my four-year-old is starting to understand it as well. But, giving them toys and gifts from our collapsible tote at major milestones really helps too. Most importantly, my husband and I make sure that we’re stocked with the basics. Individual water bottles, extra clothes (think: jackets, extra undies, and hats/gloves if it’s cold), and other things we might need that we can access easily. I normally add this to our toy tote. This helps keep my job smooth as the one who hands everything out and my husband’s job easy – to pay attention to the road! By the end of the trip, you’ll have happy (ish) kids and time to talk to your husband as you sip your Starbucks while it’s still warm. I’d say that’s a major accomplishment, don’t you? A BIG thank you to Chuck E. Cheese’s for sponsoring this conversation. All opinions are my own and we love visiting there whenever we can ~ you should definitely make a stop there too! Check them out on Facebook, Twitter, and Instagram.